Lately I’ve been organizing and cleaning my workshop. Among the items I needed to clear out were some fallen tree branches I’ve been saving. 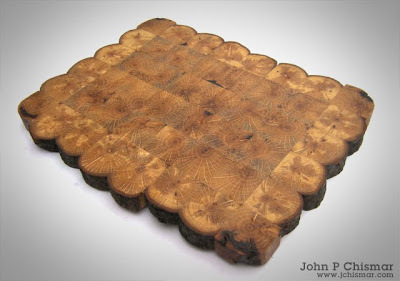 I used one for my One Arm One Step Stool; and I used an oak branch to create this trivet / cutting board. The board measures approximately 9″x12″ and is composed of several cubes cut from the branch wood which were glued and clamped together. The completed piece is finished with walnut oil, making the surface food safe.